Surely one of the most striking things ever to make a noise, other manufacturers’ top-of-the-range designs look small and flimsy by comparison. 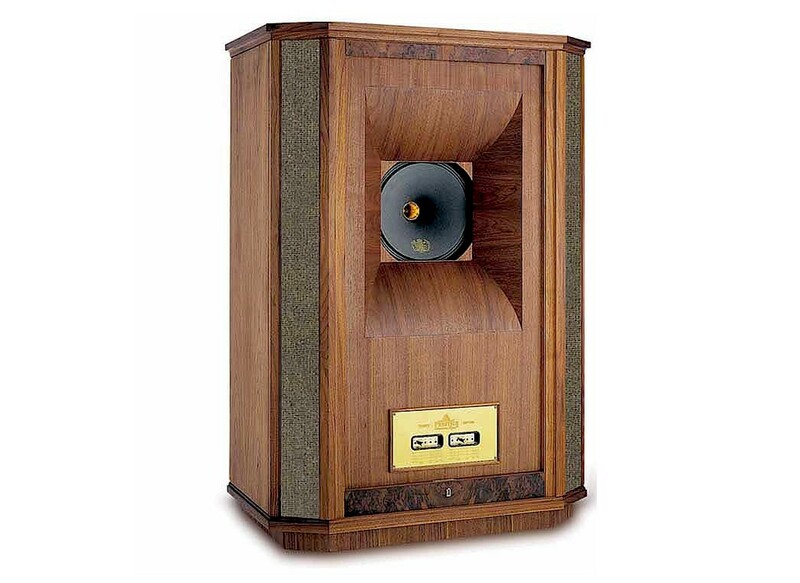 The king of Tannoy’s Prestige Range, this product is truly remarkable, however you look at it. Intimidating physical presence aside, the fact that it’s lasted so long is a testament to Tannoy’s design philosophy. While fads come and go, the Westminster has remained loyal to tradition. For example, back in the seventies and eighties, everyone from KEF to Linn was doing hopelessly complex, multi-driver designs that sapped power so much you needed a direct line into the National Grid to get a squeak out of them. Back then, the Westminster would have seemed a silly irrelevance, a ridiculous anachronism, a blast from the past. Now though, tubes are back in fashion and efficiency is good, and the big Tannoy’s design seems plain common-sense. Although its styling makes it look like something from the early Baroque period, don’t expect it to sound old and limp. Actually, this is one of the fastest, most lithe and musical speakers you’ll ever hear. This is down to a combination of its huge Dual Concentric driver in Tannoy’s largest 15 inch (380mm) incarnation, and the awesome compound horn loaded 530 litre cabinet. The result is a mind boggling 99dB sensitivity figure, which even if powered by a Discman would most likely blow your windows out. Couple this to 225W RMS power handling, thanks to the driver’s premium spec twin roll fabric surround, Alnico magnet system and Tulip Waveguide, and you’ve got something that’s louder than a Motorhead concert with the PA turned up to eleven! The frequency response characteristics are another reason to drop your jaw – the Westminster goes down to 18Hz (at –6dB), making it possibly the best ever loudspeaker for the likes of Roni Size and LTJ Bukem – drum’n’bass will never sound the same again. Despite this the dual concentric tweeter manages 18kHz (at –6dB), which is just about decent enough for smooth treble. But couple it to Tannoy’s Prestige SuperTweeter, and you’re really talking. With its massive power handling, tremendous sensitivity and subterranean bass characteristics, the Westminster can easily get the better of most PA stacks, but its air shifting abilities aren’t really the point. Musicality is what this speaker has in spades, thanks to its lightening transient response (a drive unit with a magnet the size of China moving a featherweight paper cone is hardly going to be slow, is it?) There’s also the fact that the Dual Concentric design crosses over acoustically at 200Hz and electrically at 1kHz, both of which are a long way from the ear’s most sensitive area. Factor in the Westminster’s almost unique attribute of having an enclosure with a wavefront area approaching that of real instruments, and you can see why sound flows out of this behemoth so effortlessly. The downsides of the Westminster are twofold. Firstly, with that huge paper cone flapping around in the breeze, don’t expect it to be as refined, subtle and detailed as an electrostatic. The second problem is placing the darned thing. Assuming you can afford to buy a pair, you’ll have to be rich to own a listening room large enough to swallow two 1,395x980x560mm boxes. Oh, and best pay someone else to install the combined 276kg of heavily damped and internally cross-braced solid walnut with 25 birch ply! It’s a shame that these loudspeakers are so comprehensively ignored in their home market of Great Britain. Ironic, considering that in Far East markets they’re practically de rigeur for lovers of valves and vinyl. Used in conjunction with a decent single ended tube power amp and a well preserved Garrard/ SME/ Decca combination, there are few better ways to experience jazz music without going to New Orleans. Still, this latter option may be cheaper in the long run – if you can find a pair of Westminsters, expect to pay what the seller is asking, which will likely be at least a king’s ransom. An enjoyable review, and truly said. Hi-Fi has gone backwards, not forwards – it is simplicity in design, skill, tact and wisdom of knowledge in execution, following the laws of nature, that bring about the best results. These are God given talents that money cannot buy. I have a Thorens TD150 with Shure M97xE that surely follow the same design and practical philosophies. Like the Tannoy, both designed were by men who knew what real live music and hi-fi is all about.